Kish’s BMW ran out of juice as we drove home today. Now we are stranded at the side of I-77, waiting for AAA to show up and tow us to safety. It is unnerving sitting immobile by the side of the road as semis scream past and time slides by. We will be grateful indeed when AAA comes to the rescue. Edited to add: I’m happy to report that we got off the berm and out of harm’s way and made it back to Columbus safe and sound, although the tow left us considerably poorer. When you are a hundred miles from home, and many miles away from any other BMW repair shop, your choices are few. When that happens, you just have to bend over and take it in the shorts with a smile on your face and a song in your heart. One of the many distinctive touches you find at The Greenbrier is tea time. 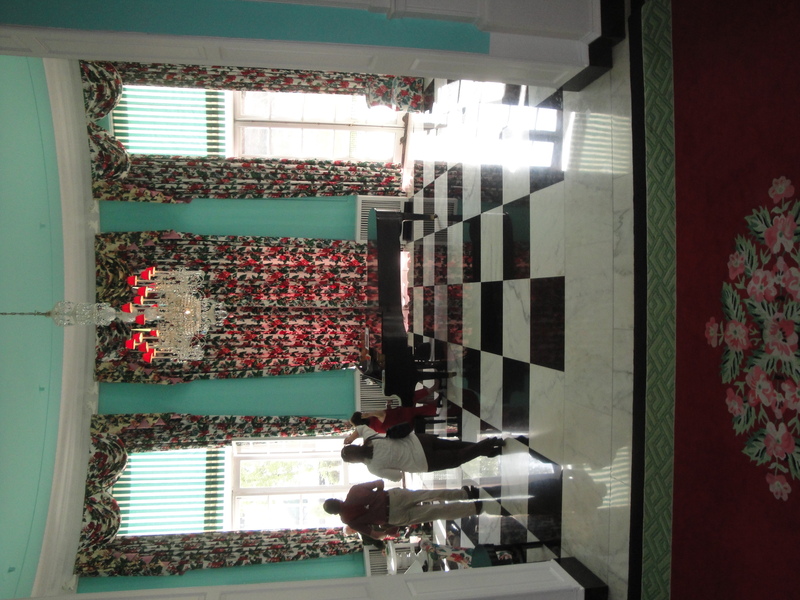 Every day at 4 p.m., a pianist sits at the grand piano in the garden room to play a march. Then, uniformed waiters and waitresses come striding into the main lobby to the cadence of the music, carrying silver trays groaning with cookies and sweets. The trays are placed on a large central table in the main lobby, tables with silver canisters of steaming hot tea and iced tea are moved into the room, and the guests descend to enjoy the feast. In the meantime, the pianist gives a 45-minute concert to all who prefer to take their tea with musical accompaniment. It is quite pleasant indeed to sit in the beautiful garden room with the pianist, sipping tea and milk, nibbling on an almond cookie, and listening to the strains of Beethoven’s Fur Elise or a medley of Disney movie tunes. Good vacations are made, I think, of little moments like this, where you do something fun and unusual in a distinctive place and then can recall the moment with pleasure after you return to your ordinary routine.